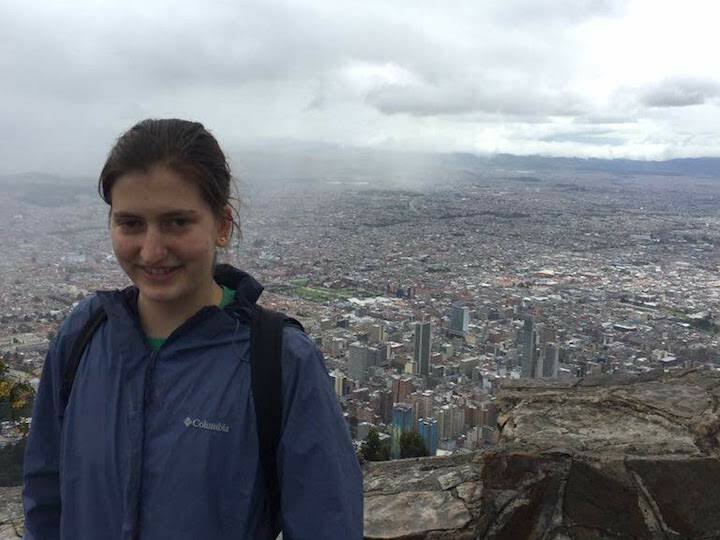 Julia Friedman at the top of Cerro Monserrate overlooking Bogotá, Colombia. The $3,000 grant funds a reporting project by a full-time undergraduate or graduate student that highlights the religious dimension of an international conflict. Friedmann, a regional and comparative studies major who studied abroad in Quito, Ecuador, returned to South America in summer 2018 to cover the role of religion in the Colombian peace process. "I decided to see if I could put together a proposal about how religious actors—either churches, individual pastors, or just the people who were religiously motivated—contribute to or impede the peace process," said Friedmann. 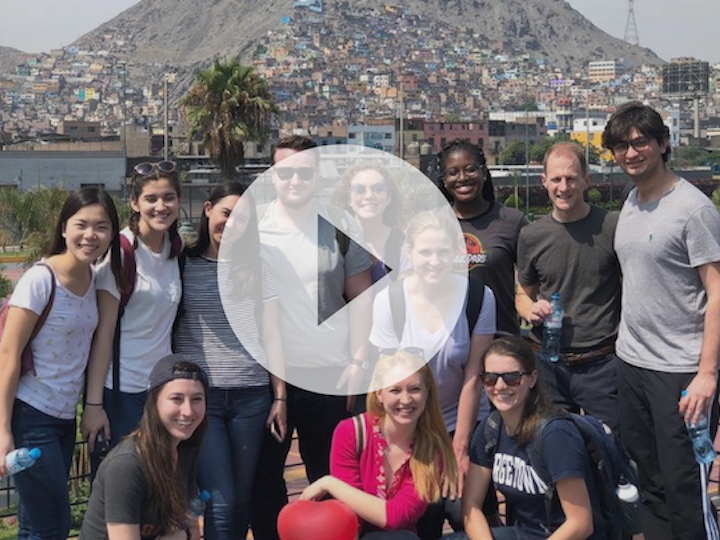 An academic concentration in Latin America provided Friedmann with an understanding of the region’s issues, but her biggest learning experience came from being on the ground for six weeks. During the reporting process, she interviewed rights activists, priests, and ex-combatants of the Revolutionary Armed Forces of Colombia (FARC). "I learned how to be persistent," said Friedmann. "When you think of reporters who go to Colombia, you don’t usually think of 20-year-old students from Georgetown University." The $3,000 grant was supplemented by contributions from Georgetown’s Institute for the Study of Diplomacy and the SFS Dean’s Office. Upon being chosen as the recipient, Friedmann was partnered with Pulitzer Center-affiliated reporter Nadja Drost, who served as a mentor during the fellowship. "Julia came to Colombia with well-developed but still broad story ideas to carry out in a very complex country she didn’t know, and she very quickly was able to hone in on what her stories were," said Drost. "In seeking out so many people to speak with, she gained a remarkable amount of knowledge of her beat, and an understanding of Colombia." 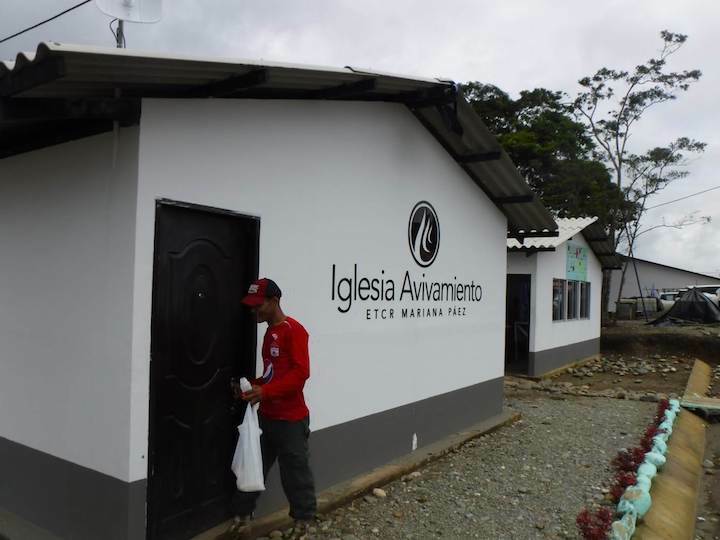 Avivamiento megachurch in Mesetas, Colombia, about 160 miles south of Bogotá. Drost connected Friedmann with a government official, who then prompted her to visit the Avivamiento megachurch in Mesetas, about 160 miles south of Bogotá. There she reported on the church’s efforts to evangelize ex-combatants for an article that was picked up by the Religion News Service. "It was very powerful because there was one point where I was just sitting on this picnic table with these two men who were ex-combatants of the FARC." said Friedmann. "One of them was trying to start a yogurt business and the other one was growing bananas. It was a very human moment." The Pulitzer Center offers reporting fellowships to students enrolled at universities participating in the center’s Campus Consortium. At Georgetown, the student fellowship is coordinated by the Berkley Center for Religion, Peace, and World Affairs. "The fellowship allows a student to travel and see what complex religious dynamics look like in a specific context and creates an opportunity to investigate how religion fits into a more complicated set of circumstances," said Shaun Casey, director of the Berkley Center. "There is no substitute for getting out from behind a desk and entering a new space and asking the right questions to get at a story." "I’m a reporter, so I’m inherently of the belief that you have to go to wherever a story is playing out—watch, talk with people, feel the story—in order to fully understand it," added Drost. "Allowing students to go to where the story is playing out, and giving them the time to explore it, is in my view, one of the best ways to develop a nuanced understanding of the issues they’re studying." After completing the reporting portion of the fellowship, fellows from across Pulitzer’s 30-campus consortium gathered in Washington, D.C., on October 26, 2018, to share their work. Friedmann’s deliverables included two news articles and a multimedia video. In addition to continuing her work with Center for Latin American Studies (CLAS) Director Fr. Matthew Carnes, S.J., who helped Friedmann develop her pitches, Friedmann is interning with a reporting contact, CLAS adjunct professor Marguerite Jimenez. Friedmann currently works with the Washington Office on Latin America, where she is directly involved in issues she covered during her fellowship. "The fellowship is something I'm going to look back on as one of the most formative of my life," said Friedman. "It's motivated me to amplify voices that have gone unheard, whether in a future career in journalism or through nonprofit work." Julia Friedmann’s work can be found on the Pulitzer Center website and on Twitter @jewelzia_. The Center for Latin American Studies awards travel grants to graduate and select undergraduate students in support of research and unpaid internships in Latin America during the summer. The Center for Latin American Studies traveled with students to Peru to visit sites in Lima, Cuzco, and Machu Picchu.